This is an all-time classic New England favorite. The best alternative to your ordinary Summer BBQ of burgers and dogs. This one-pot meal is sure to please everyone. Best part is it can be done outdoors on the grill or even inside on the stove. You can even tweak some of the ingredients if needed. 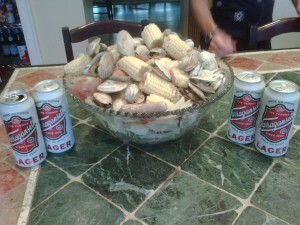 But one thing needs to remain, it’s not a New England Clam Bake without Narragansett beer, the Official Beer of the Clam. Combine potatoes, sausages, onions, corn and bay leaves in a large pot. Cover with 3 quarts cold water, all of the can of ‘Gansett and season to taste with salt, pepper and crushed red pepper. Bring to a boil, reduce heat and simmer 20 minutes. Add clams, cover and cook until they open, about 15 minutes. You can serve this right from the pot at the table. The garnish of green onions and parsley add a nice gourmet touch, but aren’t always necessary. For the bold, you can even add 2 cloves of garlic to the water and substitute linguicia for chourico. Feel free to melt butter for dipping the clams into or just use the broth. Leftover broth and clams are a great starter for some delicious chowder.